Alex Padilla is a Special Investigator with the Los Angeles Board of Police Commissioners, Office of the Inspector General, where he is assigned to the Use of Force Section. In that capacity, he oversees the Los Angeles Police Department's investigations into its most critical and high-profile incidents, including officer-involved shootings, other uses of deadly force, and in-custody deaths. Prior to joining the Office of the Inspector General in 2011, Mr. Padilla worked for One West Bank as the Vice President of Corporate Security. He was responsible for the administrative oversight and leadership of Physical Corporate Security. He was responsible for critical system analysis, handling sensitive investigations, implementation of policies and procedures, and maintaining effective communication with executive staff, coworkers and customers. Mr. Padilla also served as the commander for the Crisis and Hostage Negotiation Team, Field Training Officers Program, Liability Assessment Unit, Youth Services Division and the Special Enforcement Division. Mr. Padilla is the immediate past president of the Los Angeles Chapter of the Hispanic American Police Command Officers Association, which is a national executive law enforcement leadership organization. Mr. Padilla served as the Chairperson for the City of Inglewood's Citizen Police Oversight Commission. 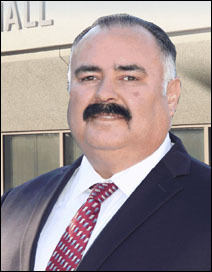 Mr. Padilla has a bachelor's degree in Business Management from the University of Redlands. He is a graduate of the Police Officers Standard of Training (POST) Executive Development Course, the Police Executive Research Forum's Senior Management Institute Program (SMIP), which is taught by professors from Harvard's Kennedy School of Government, and is a graduate of POST Command College Class 46, a master's level program focused on the future of law enforcement. Mr. Padilla has resided in the City of Inglewood's 2nd District for over 25 years with his wife, Stella and their three adult children - Priscilla, Alejandro and Miguel. Mr. Padilla is the author of "Police Dormitories - Build it and They Will Come."